The global market for RBD coconut oil has grown considerably over the past few years. This is predominantly because of rising consumer consciousness towards healthier diets. RBD coconut oil has now become popular in mainstream supermarkets of other countries than its major producers and its industrial applications are developing. The market for RBD coconut oil in around the world is expanding from straight consumption to industrial uses. The health & wellness trend has directed the global food industry to start using the oil in high-end products. Moreover, coconut oil applications spread far outside food categories, crossing over into cosmetics among other health and beauty products. The coconut application is found in eye creams, lip gloss, cuticle oil, as well as balms and lotions for the body. Numerous applications and growing demand for coconut oil across the globe for its health benefits is likely to drive the growth of RBD coconut oil market growth. Goldstein Research analyst forecast the global RBD coconut oil market to expand at a CAGR of 6.02% during the forecast period 2016-2024. The demand for RBD coconut oil end products in various industries around the world reached USD 4.1 billion in 2016, which is likely to reach USD 6.5 billion by the end of the forecast period. The report covers the present ground scenario and the future growth prospects of the RBD coconut oil market for 2016-2024 along with the total revenue of RBD coconut oil industry in every region. We calculated the market size and revenue share on the basis of revenue generated per segment, regional and country level. The revenue forecast is given on the basis of number of RBD coconut oil manufacturers and current growth rate of the market. Based on end users, food and beverage industry accounted for the largest revenue of 55% in global RBD coconut oil market in 2016. Moreover, beauty and cosmetics segment is the most lucrative segment which is likely to provide immense opportunity owing to developing RBD coconut oil applications in numerous cosmetics and beauty products. Further, the beauty and cosmetic industry is anticipated to grow at a CAGR of +9% over the forecast period. Global RBD Coconut Oil Market Outlook 2016-2024, has been prepared based on an in-depth market analysis from industry experts. 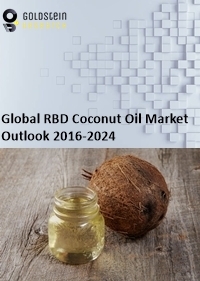 The report covers the competitive landscape and current position of major players in the global RBD coconut oil market. The report also includes porter’s five force model, SWOT analysis, company profiling, business strategies of market players and their business models. Global RBD coconut oil market report also recognizes value chain analysis to understand the cost differentiation to provide competitive advantage to the existing and new entry players. Our global RBD coconut oil market report comprises of the following companies as the key players in the global RBD coconut oil market: Marico Limited, Wilmar International, The HallStar Company, Cargill Corporation, Oleo-Fats Incorporated (D&L Industries Ltd.), Bunge Limited, The Adams Group, Inc. and Archer Daniels Midland Company. According to our global RBD coconut oil market study on the basis of extensive primary and secondary research, one major trend in the market is mass branding and marketing of coconut oil as healthy edible oil as compared to other popular substitutes such as Palm oil and sunflower oil among others. Not only as edible oil but also in beauty and cosmetic industry RBD coconut oil has created a significant space and the market is likely to upsurge in coming years. According to the report, major driver in global RBD coconut oil market is growing health conscious population and inclination towards healthy diets. For instance, more than 70% of Americans looks at coconut oil as a healthy product. Moreover, global organic beauty product market accounted for USD 10.3 billion in 2016, of which major beauty products use some kind of coconut oil extracts. Further, the report states that one challenge in global RBD coconut oil market is growing coconut oil price attributed to the growing demand and reducing coconut production capacity. Supply constrictions and lower production have hiked up coconut oil and copra prices to a new high in recent months. Owing to growing prices, players have shifting towards other economical substitutes such as palm oil is the major challenge for the RBD coconut oil market growth. Based on geography, Asia Pacific region accounted for the largest market share of more than 70% of global RDB coconut oil market owing to major production and consumption of coconut RBD oil in the region. On the other hand, demand from developed countries of Europe and North America has been growing significantly from past few years owing to growing popularity of coconut oil as healthy substitute to other edible oils and numerous applications in beauty and cosmetics industry. Further, the markets in North America and Europe are likely to expand at a CAGR of +6.5% over the forecast period.